2 GENESIS 1:31-2:1 31 And God saw every thing that he had made, and, behold, it was very good. And the evening and the morning were the sixth day. 1 Thus the heavens and the earth were finished, and all the host of them. All the host of the heavens and the earth. 3 “…ALL THE HOST” Would “all the host” include the angels? 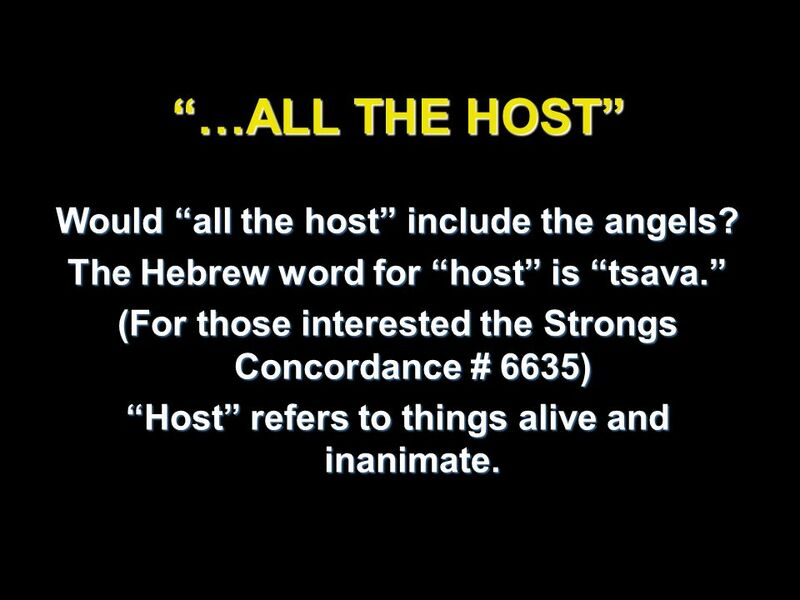 The Hebrew word for “host” is “tsava.” (For those interested the Strongs Concordance # 6635) “Host” refers to things alive and inanimate. 4 JOSHUA 5:13-15 13 And it came to pass, when Joshua was by Jericho, that he lifted up his eyes and looked, and, behold, there stood a man over against him with his sword drawn in his hand: and Joshua went unto him, and said unto him, Art thou for us, or for our adversaries? 14 And he said, Nay; but as captain of the host of the LORD am I now come. And Joshua fell on his face to the earth, and did worship, and said unto him, What saith my lord unto his servant? 15 And the captain of the LORD’S host said unto Joshua, Loose thy shoe from off thy foot; for the place whereon thou standest is holy. And Joshua did so. 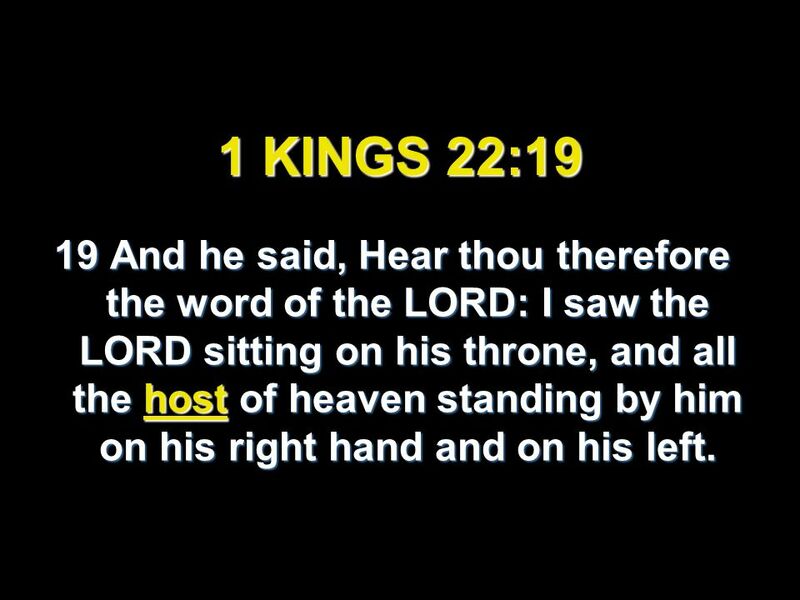 5 1 KINGS 22:19 19 And he said, Hear thou therefore the word of the LORD: I saw the LORD sitting on his throne, and all the host of heaven standing by him on his right hand and on his left. 7 PSALM 148:2, 3 2 Praise ye him, all his angels: praise ye him, all his hosts. 3 Praise ye him, sun and moon: praise him, all ye stars of light. 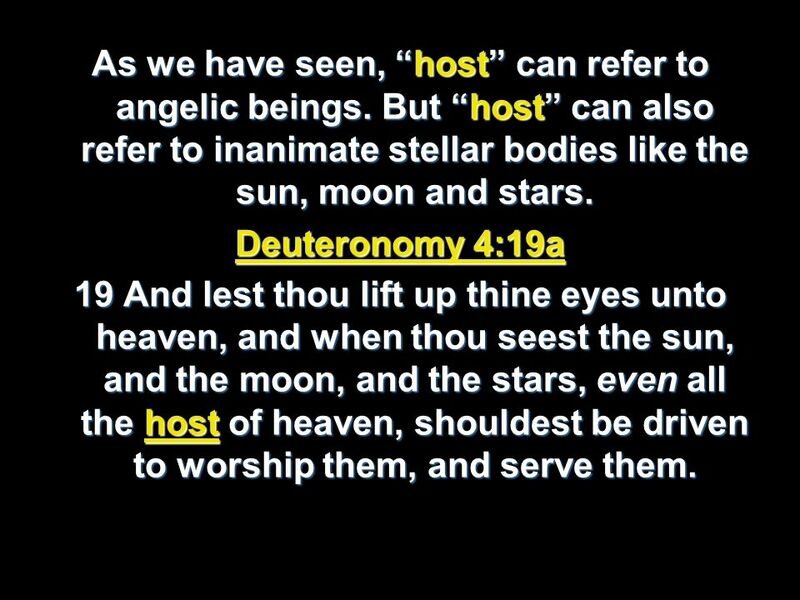 As we have seen, “host” can refer to angelic beings. But “host” can also refer to inanimate stellar bodies like the sun, moon and stars. Deuteronomy 4:19a 19 And lest thou lift up thine eyes unto heaven, and when thou seest the sun, and the moon, and the stars, even all the host of heaven, shouldest be driven to worship them, and serve them. 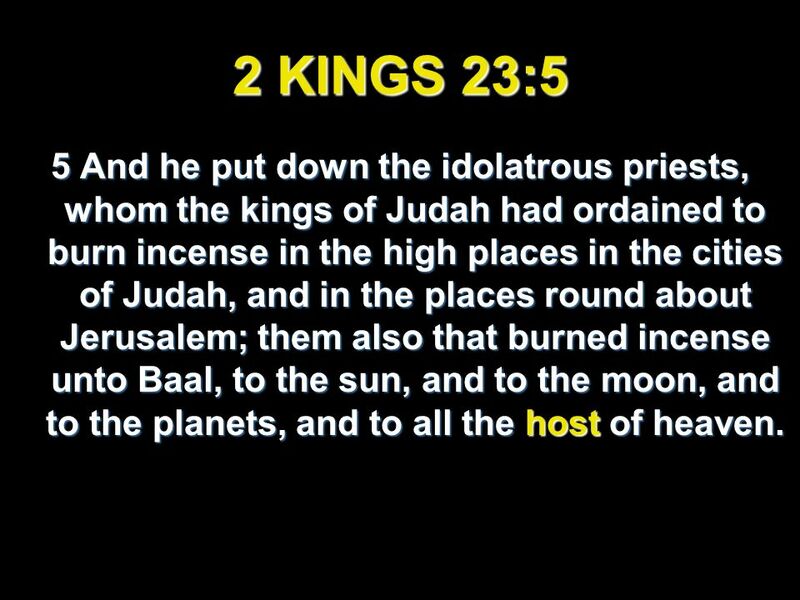 9 2 KINGS 23:5 5 And he put down the idolatrous priests, whom the kings of Judah had ordained to burn incense in the high places in the cities of Judah, and in the places round about Jerusalem; them also that burned incense unto Baal, to the sun, and to the moon, and to the planets, and to all the host of heaven. 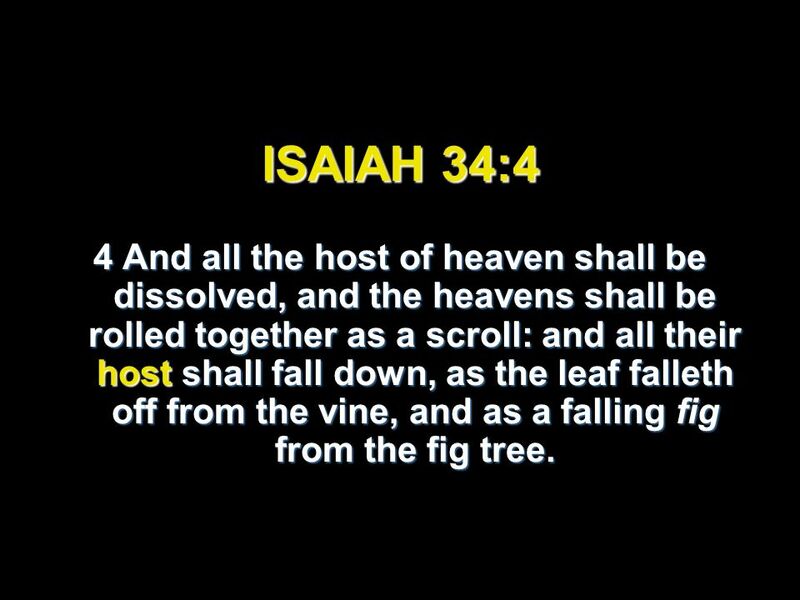 10 ISAIAH 34:4 4 And all the host of heaven shall be dissolved, and the heavens shall be rolled together as a scroll: and all their host shall fall down, as the leaf falleth off from the vine, and as a falling fig from the fig tree. 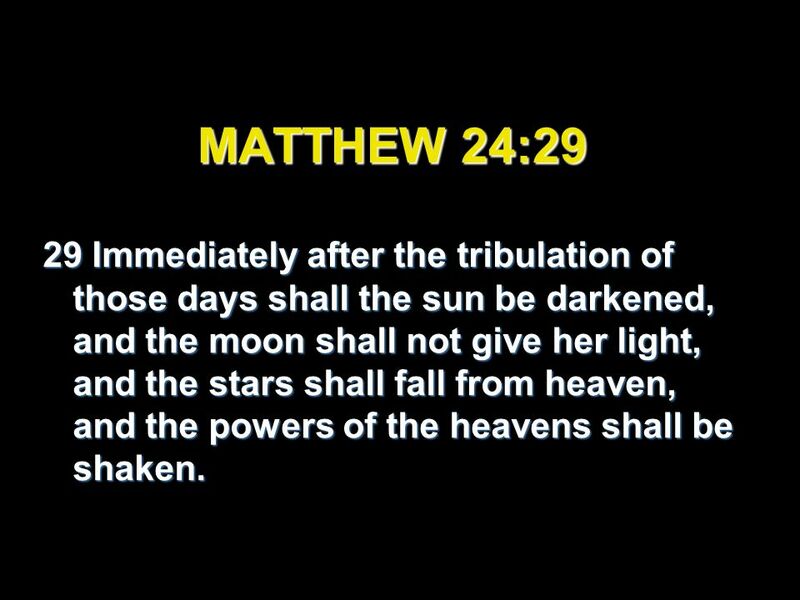 11 MATTHEW 24:29 29 Immediately after the tribulation of those days shall the sun be darkened, and the moon shall not give her light, and the stars shall fall from heaven, and the powers of the heavens shall be shaken. 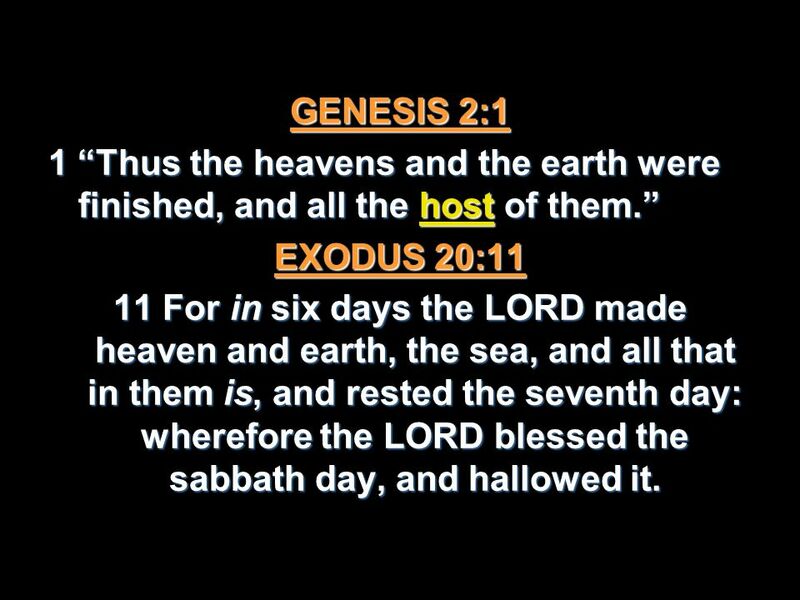 12 GENESIS 2:1 1 “Thus the heavens and the earth were finished, and all the host of them.” EXODUS 20:11 11 For in six days the LORD made heaven and earth, the sea, and all that in them is, and rested the seventh day: wherefore the LORD blessed the sabbath day, and hallowed it. 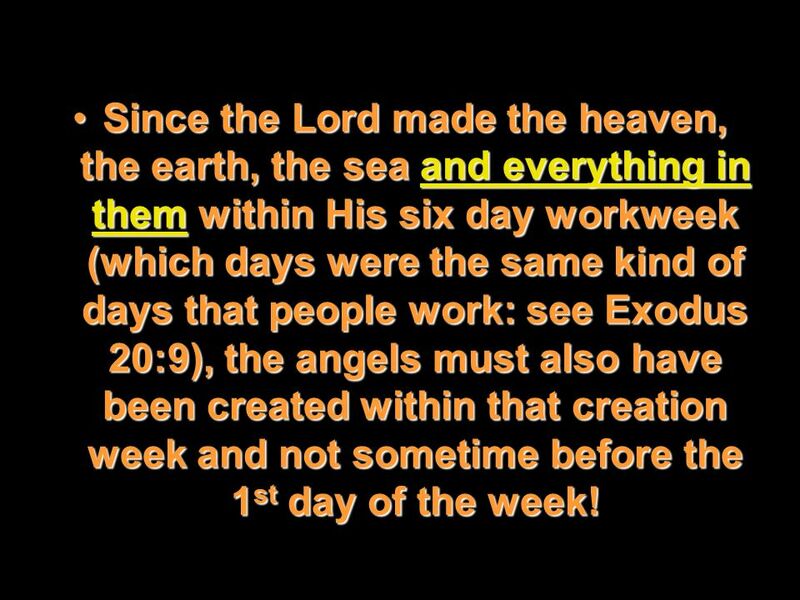 13 Since the Lord made the heaven, the earth, the sea and everything in them within His six day workweek (which days were the same kind of days that people work: see Exodus 20:9), the angels must also have been created within that creation week and not sometime before the 1st day of the week! 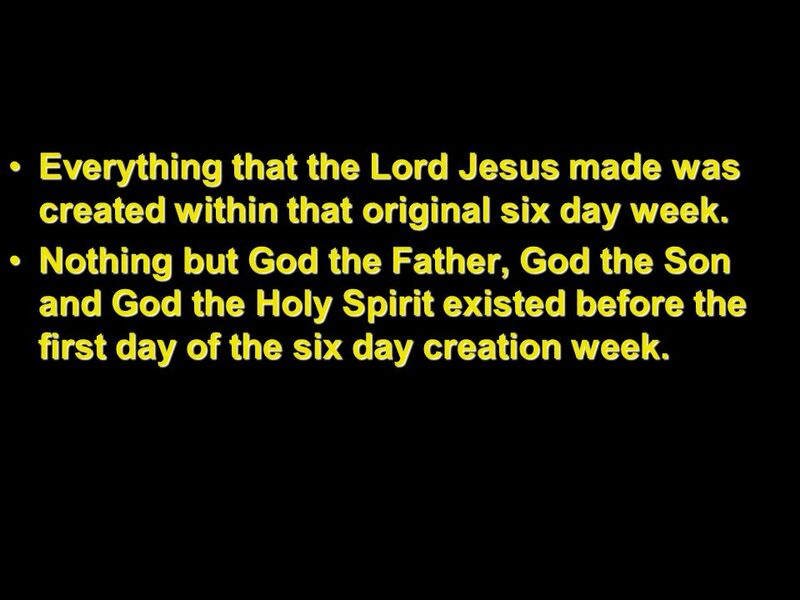 14 Everything that the Lord Jesus made was created within that original six day week. 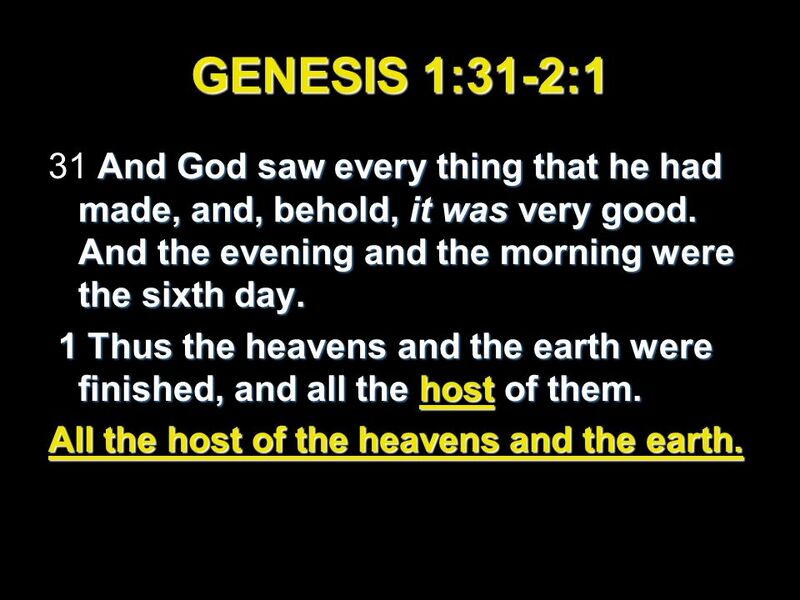 Nothing but God the Father, God the Son and God the Holy Spirit existed before the first day of the six day creation week. 16 JOB 38:7 4 Where wast thou when I laid the foundations of the earth? declare, if thou hast understanding. 5 Who hath laid the measures thereof, if thou knowest? or who hath stretched the line upon it? 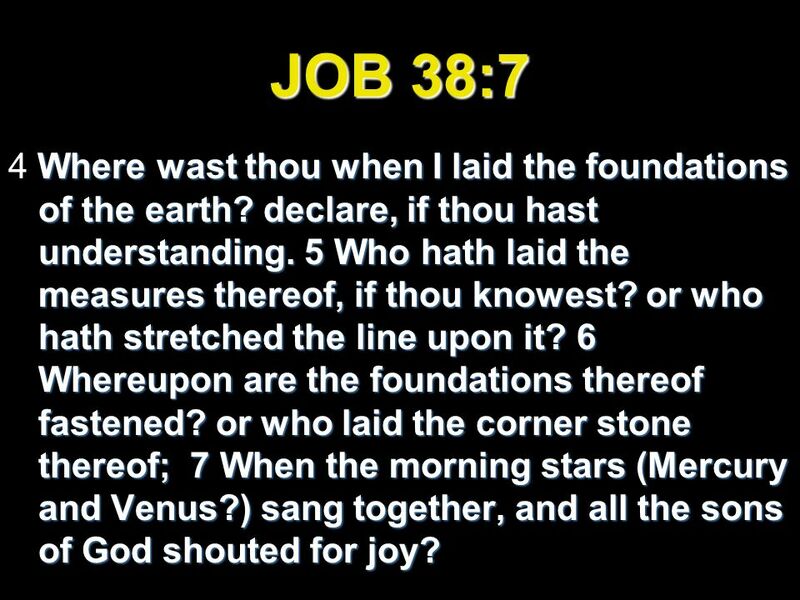 6 Whereupon are the foundations thereof fastened? or who laid the corner stone thereof; 7 When the morning stars (Mercury and Venus?) sang together, and all the sons of God shouted for joy? The angels seem to be observing God as He creates. Could they have been created on the first day of the creation week? 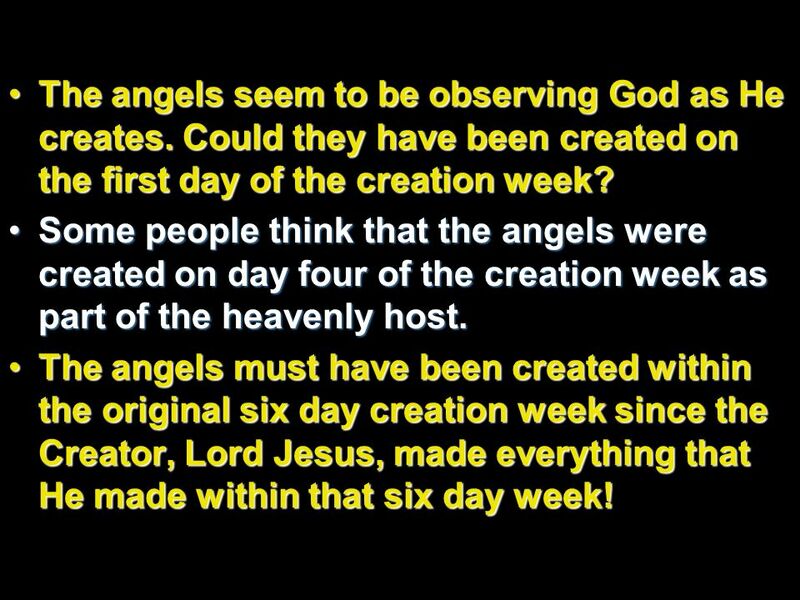 Some people think that the angels were created on day four of the creation week as part of the heavenly host. 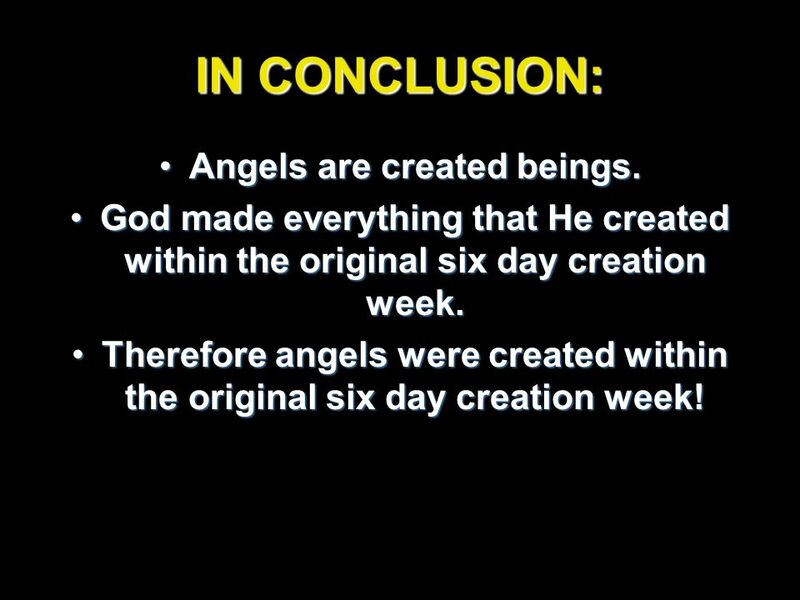 The angels must have been created within the original six day creation week since the Creator, Lord Jesus, made everything that He made within that six day week! 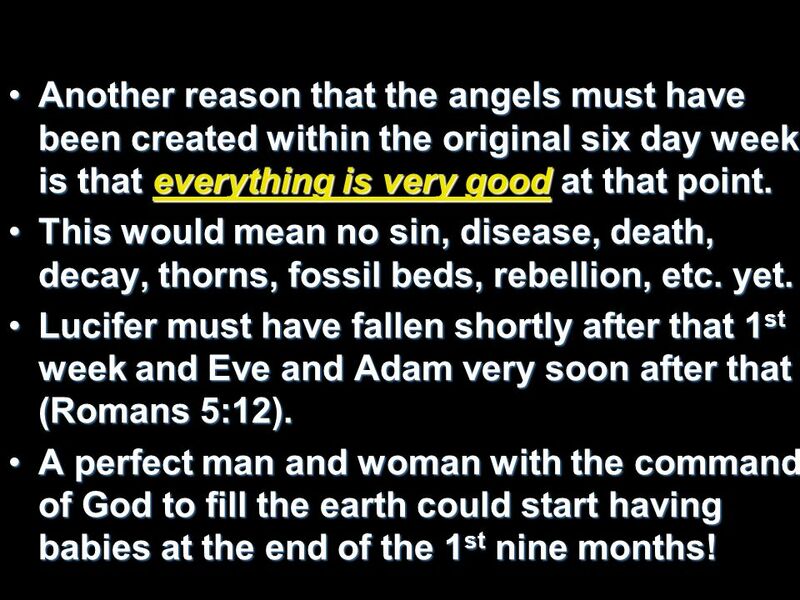 18 Another reason that the angels must have been created within the original six day week is that everything is very good at that point. This would mean no sin, disease, death, decay, thorns, fossil beds, rebellion, etc. yet. Lucifer must have fallen shortly after that 1st week and Eve and Adam very soon after that (Romans 5:12). A perfect man and woman with the command of God to fill the earth could start having babies at the end of the 1st nine months! 19 Angels are created beings. IN CONCLUSION: Angels are created beings. God made everything that He created within the original six day creation week. 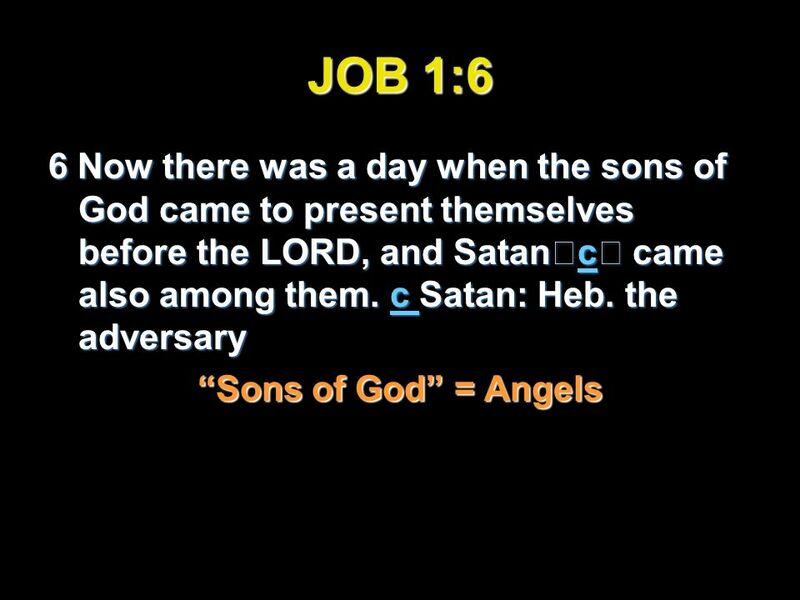 Therefore angels were created within the original six day creation week! 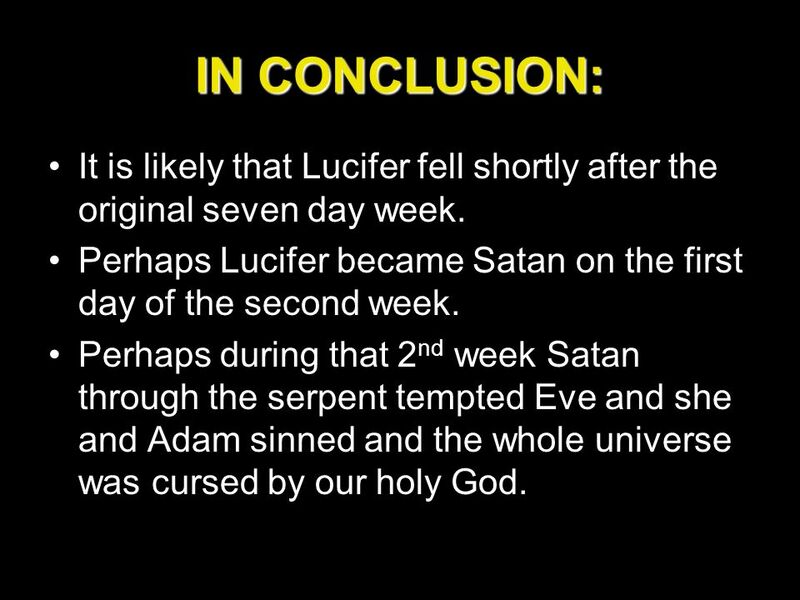 20 IN CONCLUSION: It is likely that Lucifer fell shortly after the original seven day week. Perhaps Lucifer became Satan on the first day of the second week. 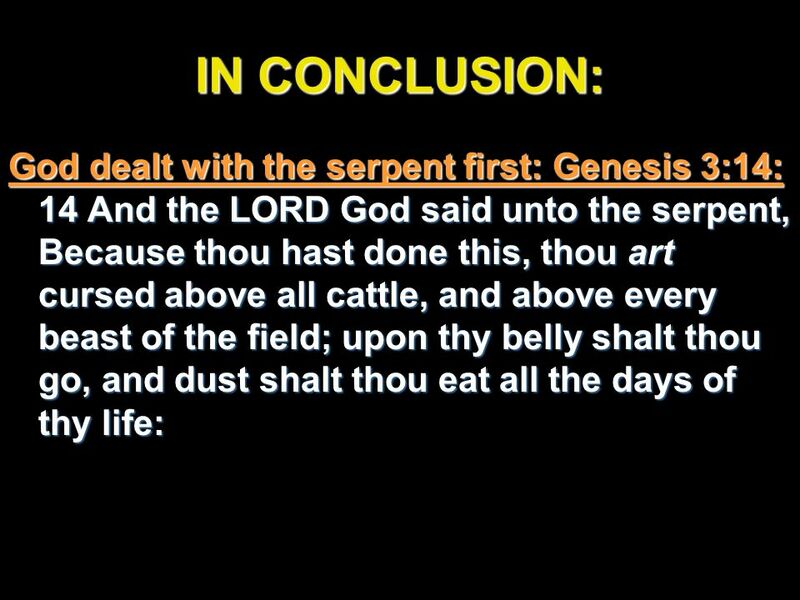 Perhaps during that 2nd week Satan through the serpent tempted Eve and she and Adam sinned and the whole universe was cursed by our holy God. 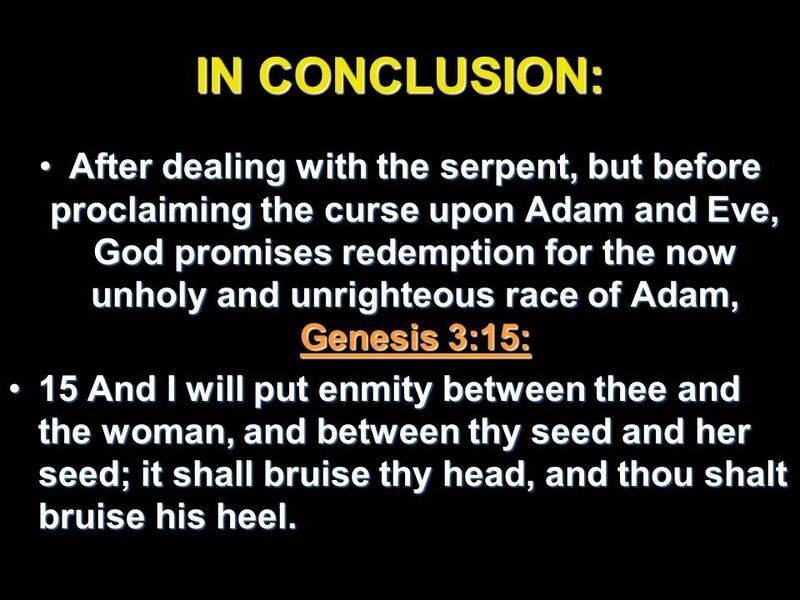 22 IN CONCLUSION: After dealing with the serpent, but before proclaiming the curse upon Adam and Eve, God promises redemption for the now unholy and unrighteous race of Adam, Genesis 3:15: 15 And I will put enmity between thee and the woman, and between thy seed and her seed; it shall bruise thy head, and thou shalt bruise his heel. 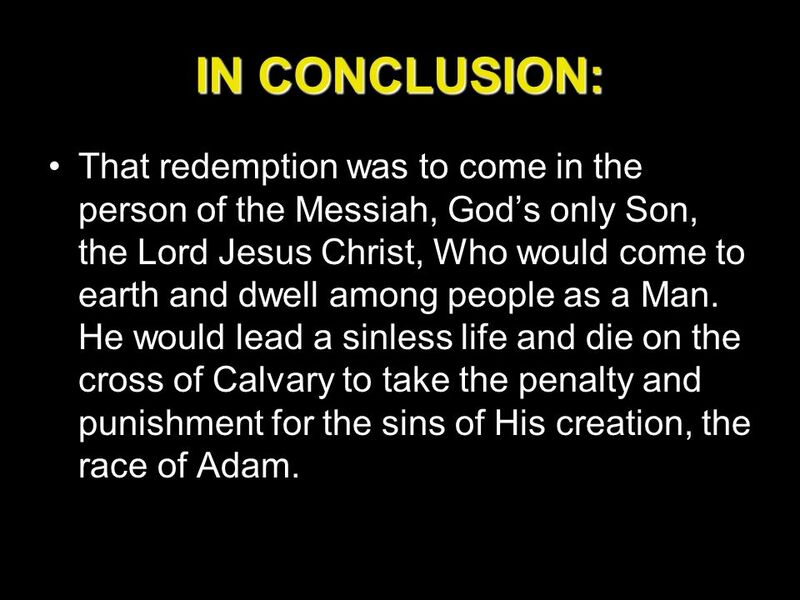 23 IN CONCLUSION: That redemption was to come in the person of the Messiah, God’s only Son, the Lord Jesus Christ, Who would come to earth and dwell among people as a Man. He would lead a sinless life and die on the cross of Calvary to take the penalty and punishment for the sins of His creation, the race of Adam. Download ppt "Biblical Discipleship Ministries"
Spring In Central Texas To everything there is a season, and a time to every purpose under heaven. Ecclesiastes 3:1. Mark 16:1-20 And when the sabbath was past, Mary Magdalene, and Mary the mother of James, and Salome, had bought sweet spices, that they might come and. LUTHERAN HOUR MINISTRIES The Nature of God Click to watch video. Questions or Comments? Exo And he said, I beseech thee, shew me thy glory. 19 And he said, I will make all my goodness pass before thee, and I will proclaim the name.